Retired Navy Rear Admiral Josephus A. Briggs, Sr., 93, of the 1600 block of Old Donation Parkway, died May 28, 1993, in a Virginia Beach hospital. Station, Newport, Rhode Island, and Commander of a subchaser and a seaplane tender. During WWII served as Commander of 2 seaplane tenders and antisubmarine squadrons in Trinidad, Bermuda, Natal, Brazil, Northern Iceland with Norwegian ASW airplanes and in Port Lyautey, French Morocco, where also established and commanded the Naval Air Station at the French airfield on November 11, 1942 (the date of the Armistice with the French in Africa). He also assumed duties of Port Director, Supervisor of the salvage operations of ships scuttled in the Wadi Sebou River; Liaison Officer with the US Army and the French Army-Navy officials then in Port Lyautey until late December 1942, when he escorted a convoy to Boston and resumed duties in Icelandic waters with the seaplane tender USS Brnegat (AVP-10). After serving as Deputy and Chief-of-Staff of the Navy Air Technical Training Command, he commanded a Jeep aircraft carrier during the invasions of Luzon, P.I., Okinawa and Hokkaido, Japan. For these services he received three Legion of Merit medals with Combat V; 2 Presidential and Secretary of the USN Unit Citations and various area and campaign medals. After WWII, he served as senior Navy member of the staff of the Army-Navy Staff College; as Professor of Naval science and Commander of the Navy Reserve Unit at the Georgia Institute of Technology; as Commanding Officer of the USS TARAWA (CV-40); as USN Director of the Continental US Defense Planning Group; as Navy Aviation representative to Spain during August-October 1951, responsible for the selection of Roat; as Chief of the Navy Advisory Group to France until his retirement there in June 1953, and for which services he was awarded the French Legion of Honor, Commander rank. After his retirement, he developed an industrial management corporation, The Special Projects Consultants Inc of Washington, DC, and was its president and Chairman until 1971 when he dissolved it. During his retirement years he was active in Naval Academy Alumni Assn affairs, was past president of the Washington, DC, Chapter and recruited for the Academy. He participated in civic affairs, and was a member of the Army-Navy Town Club, NY Yacht Club and several military and civilian organizations. Survivors include a son, Robert Plane Briggs of Tucson, Arizona, whose mother, Marie Plane Briggs, died in 1964; and one granddaughter, Felicia Briggs of Falls Church, Virginia. A memorial service will be conducted at 2 pm Thusday in H.D. Oliver Funeral Apts, Laskin Road. Burial will be private in Arlington National Cemetery. His first wife, Marie Plane Briggs (died 1964) and his second wife, Marjorie Powell Hamilton Briggs, are buried with him. 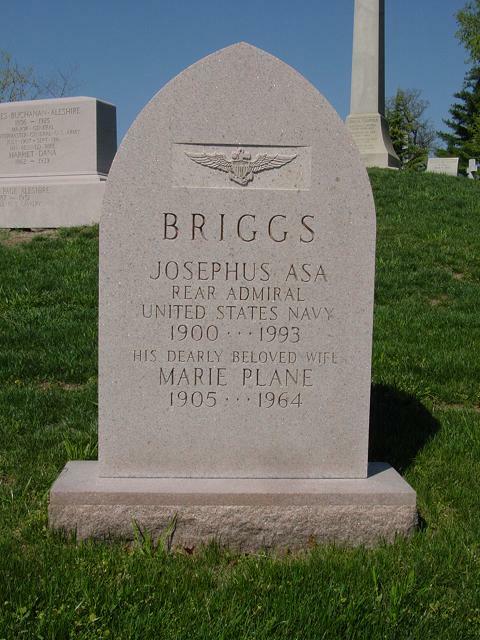 His son, Josephus Asa Briggs, Jr, Colonel, United States Air Force, died on July 4, 1985 and is also buried in Arlington.